With this blog I want to establish a simple baseline statement or overview about openEHR archetypes, aggregated from other posts and publications – a reference point if you like – from which we can journey further and in more detail into the issues around clinical modelling using specific archetypes. Archetypes are a strong basis for data liquidity. Create the archetype once, agree through peer-review, re-use when and where required – the foundation for a ‘universal health record’. An archetype is a structured, computable specification for one single, discrete clinical concept. – much simpler! 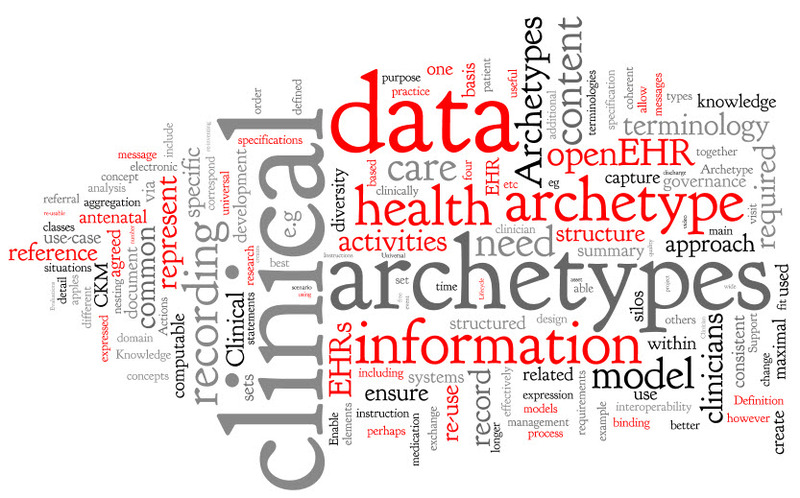 Each archetype is a rich health data specification, defined and agreed by the clinicians themselves to ensure that each model is ‘fit for clinical purpose’. Collectively these archetypes together can create an electronic health record ‘lingua franca’, or an example of PCAST report‘s ‘Universal Exchange Language (although archetypes are not limited only to exchange of health information). Complex, compound concepts – such as ‘Medication order‘, or recording how a ‘Procedure‘ has been carried out. Potential ‘agents for change’ – allowing knowledge-driven EHRs as an orthogonal approach to EHR development. A change of mindset – no longer silos of data; no longer message and document driven. As a maximal data set effectively everything one can think of about a clinical concept in all situations by the consumer and any and all providers. This design intent is pragmatically constrained to be sensible in some situations, however good archetype design will always ensure that the full model can be achieved through nesting of additional archetypes to create the maximal dataset/universal use-case ideal. For the ‘universal use-case‘ – for re-use in any and all scenarios, from use at home, to primary care, community care, hospital care, secondary use and for research. Think about how the clinician may record the data: different clinicians will need differing approaches to recording their health information and the models need to allow for this clinical diversity. Some will prefer to use more free text and others more structure; some need more detail than others; we need to capture current requirements for recording and exchange while keeping in mind what might be best practice in the near and distant future. The best designers, without a doubt, have a clinical background. I have seen clinicians and non-clinicians given identical clinical content, but the archetypes produces are surprisingly different. 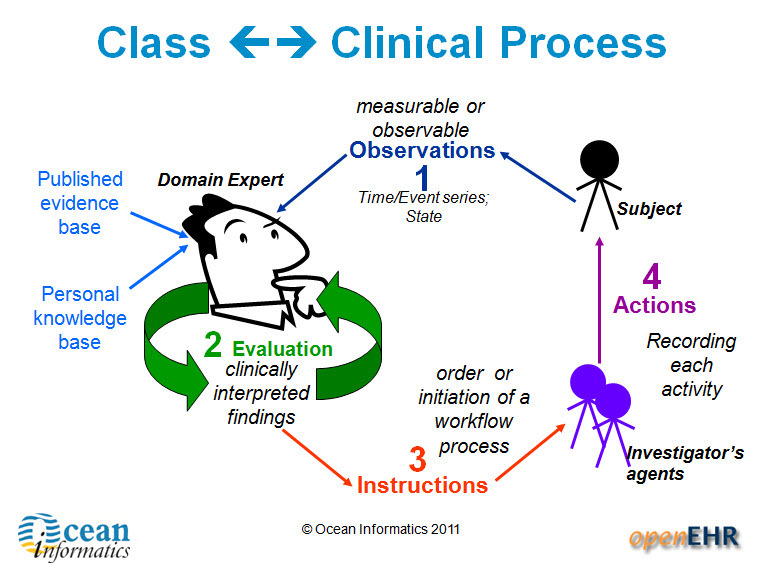 Clinician modellers definitely model their domain better than those who are not familiar with clinical practice. They are perhaps better able to envision the fractal nature of medicine and take that in to account in creating archetypes, especially the complex areas which require nesting of archetypes within each other to capture the depth and richness required in the models. Integration with terminologies such as SNOMED, ICD or LOINC are strategic and important – the structure of an archetype is not enough to represent clinical information adequately, and similarly terminology alone is inadequate. However the combination of terminology within an archetype structure, by naming elements or provision of value sets, is semantically very powerful. There is still considerable work to be done to determine how to represent the information overlap – that which can be expressed either in the archetype structure itself or via terminology. This remains a ‘grey zone’ and is a pressing area for collaboration or research. There are four main categories of archetypes that are useful to understand – each corresponding to classes in the openEHR Reference Model. 1. Compositions – which correspond to commonly used clinical documents, such as ‘antenatal visit’ or ‘care plan’. 2. Sections – these are effectively used to assist with human navigation within EHRs and correspond to document headings, for example ‘antenatal examination’ or ‘summary’. Actions – recording clinical activities e.g. procedure or medication administration. Actions complement the instruction and can record the ensuing state of the instruction, such as ‘completed’ or ‘cancelled’. Archetypes are freely available under a Creative Commons license. Constraining the maximal dataset archetypes so that only relevant data elements are active. Examples include all clinical content required for a specific Message, Document, Clinical consultation or Report e.g. a histopathology report, a referral, an antenatal visit or a discharge summary. In this way we can, in colloquial terms, ‘have our cake and eat it too’. At the same time, CKM ensures tight clinical knowledge governance, yet templates allow for expression of clinician diversity. Enable knowledge-based activities eg Clinical Decision Support Systems – consistent & coherent; create once, re-use in all systems. This entry was posted in Clinical modelling and tagged archetype, CKM, Clinical Knowledge Manager, clinician, data, EHR, health information, openEHR, shared health record, universal health record by Heather Leslie. Bookmark the permalink.